The AA Navigator Traffic Edition 5040T GPS navigation system is a fully integrated navigation and traffic solution, which provides you with up-to-the-minute AA traffic information along your route and gives you the option to route around any traffic problems. The traffic information received by the AA Navigator 5040T is free, with no further fees or subscriptions. Includes 6-months use of AA Speedcare and 256MB memory card. AA Navigator 5040T has been discontinued. The AA Navigation Traffic Edition 5040T satellite navigation system comes with a full-colour 3.5-inch screen that can be viewed in either landscape or portrait mode. As well as incorporating the fully featured AA navigation software, the 5040T will receive traffic information via a radio receiver built into the in-car power cable. AA Traffic information is broadcast 24/7, 365 days of the year and is received by the radio receiver, providing you with detailed traffic information along your route. You then have the option of automatically rerouting around any traffic incidents. The AA satnav radio receiver works completely independently from the car radio. Traffic incident information is collected by ITIS - using a variety of techniques, and the updates typically reflect the situation on the ground about 30 minutes before broadcast. The information itself is re-broadcast every few minutes. Based on the quality of radio reception of the RDS-TMC broadcasts, the AA navigator global positioning system will typically receive and decode information every 15-20 minutes when on the move. The AA Navigator 5040T satnav system incorporates a fully integrated, latest generation SiRF III GPS receiver. The AA satellite navigation system is also a fully functional PDA running Windows Mobile 2003 and this GPS navigator includes software such as Outlook, Word, Excel and Microsoft Active Sync so you can connect to your home or work PC. The in-car power cable incorporates a radio traffic receiver. The external antenna for the traffic receiver is easy to install. The windscreen mount with optional permanent fixing point and the integrated speaker provides voice guidance. 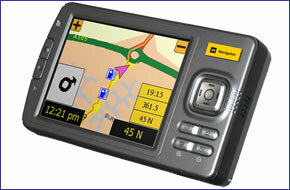 The AA Navigator 5040T 256 MB SD card incorporates AA Navigator software and maps of Great Britain and Northern Ireland. Also included is a lifetime license to the AA's traffic service, with no additional fees or subscriptions.